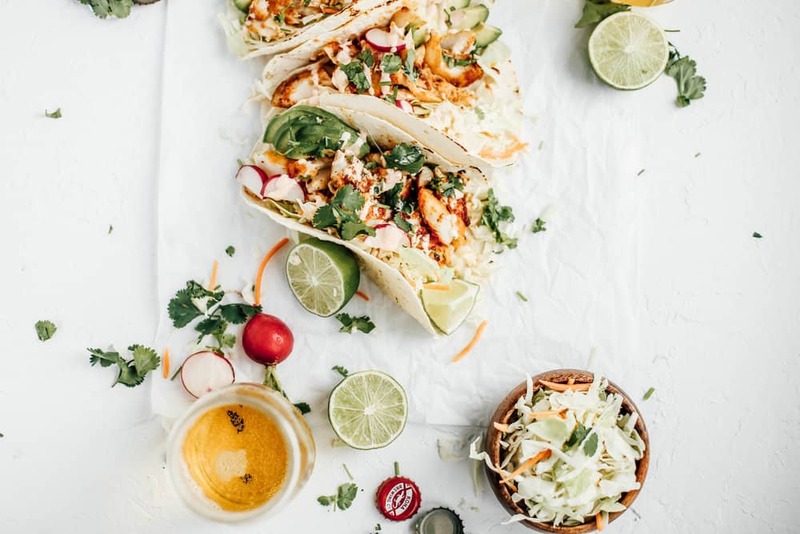 Blackened cod fish tacos filled with flaky and juicy cod, topped with classic shredded cabbage and drizzled with a spicy Sriracha lime crema. Hello hello! I suppose I am starting the weekend early. Currently posted up at a local brewery (drinking wine) and having a little evening snack with Rascal. Jared is working late so I thought I would get out of the house for a little change in scenery. I usually work for a few hours in the evening in a more relaxed fashion than during the day. Which means some kind of dinner going, my favorite show playing on netflix (currently gossip girl reruns) and my laptop up and going. I honestly love it and don’t mind working in the evenings even a little. I’m a workaholic and proud to admit. I’m sure this will change in time but I’m only into month 5 of self employment and so far it’s a dream that I never want to wake up from. I’m sitting here trying to think of really exciting things to tell you about this week but it was pretty standard! I had a solid photoshoot with Abbie at the house on Tuesday (ton’s of new content coming your way!) and I have been prepping for a second shoot with Purely Elizabeth next week in Boulder, CO (so excited!). Is it just me or every time I rent a car I feel so ‘adult’?! I’m 25 so I no longer have to pay that crazy ‘you’re too young to rent a car fee’ so I suppose that’s nice but it also makes me feel old-er. Yesterday we went for a little evening outing (we usually just chill at home during the week days!) out to dinner at Whole Foods and a small search at South Coast Plaza for a new coffee table. I’m mostly just obsessed with the CB2 that recently opened there and will take any excuse to get there. If you’re ever on the search for good food styling props, I alllllllways find some goodies there. These bowls are recently my favorite find. 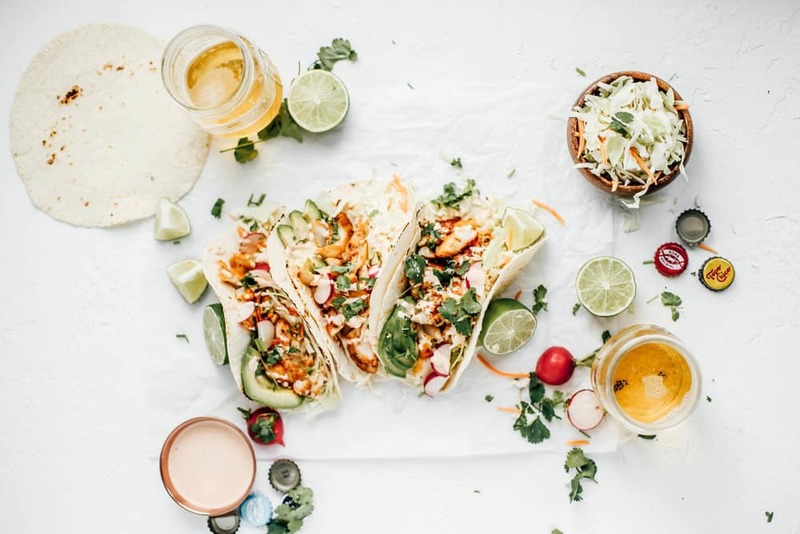 Besides my super standard every day week I am also going to chat you up about these epic blackened cod fish tacos. 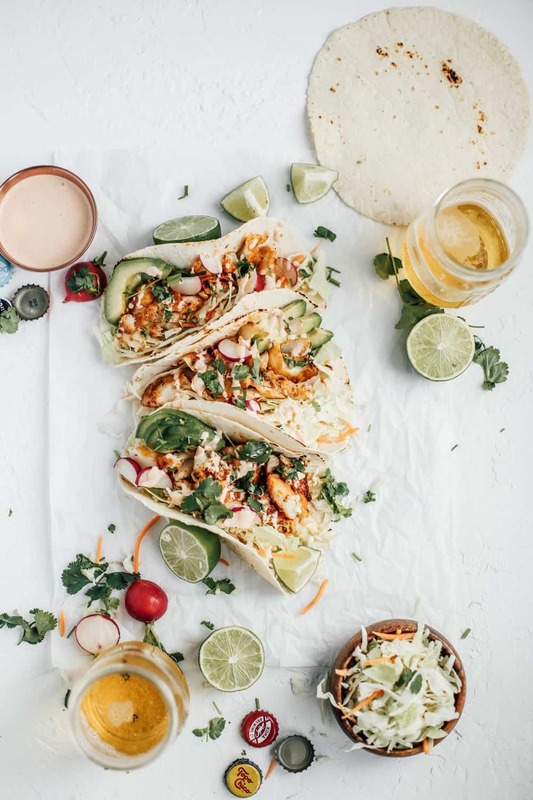 These tacos are like your standard, delicious, everyday (taco Tuesday!) 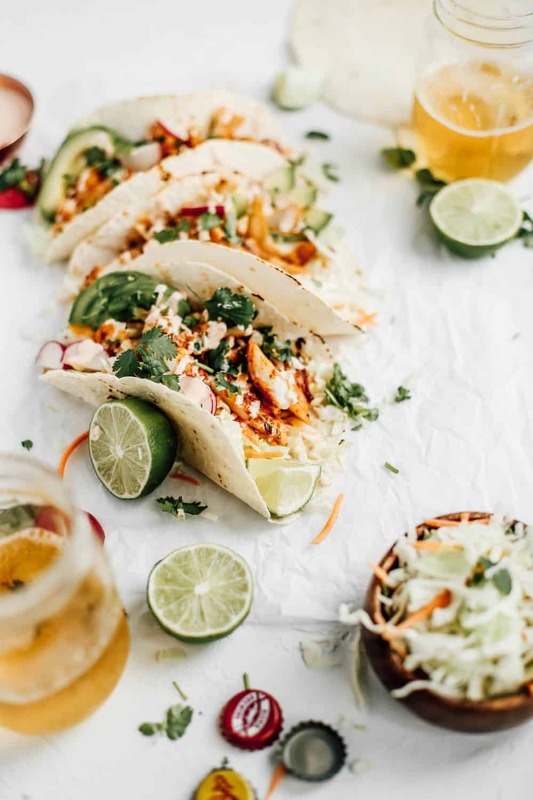 tacos that you order at a restaurant but you should most certainly give them a go at home! 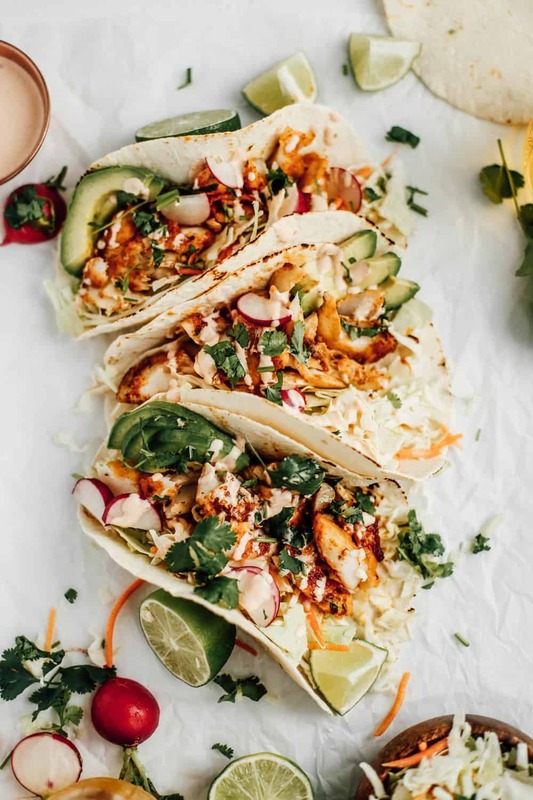 They are filled with flaky and juicy cod, topped with classic shredded cabbage and drizzled with a spicy Sriracha lime crema (because everyone as Sriracha in their fridge!). These are really classic tacos. There is nothing too wild and crazy about them (prep wise!) but they are still like ‘go for thirds’ good. I’ll even tell you a secret… I totally always eat them on low carb tortillas. The flavor still shines through and I feel like I am eating something a little better for me. I always try to eat a healthier meal on the weeknights. The cod is topped with a classic blackened seasoning, very lightly fried up (or you could grilled them!) and topped off with shredded cabbage, chopped cilantro, lime juice, avocado slices and a creamy Sriracha crema for some heat. This recipe is great for a crowd or if you’re having people over on the weekends as well. The flavor profile on these tacos I find is something most people really like. Toppings: radish slices, chopped cilantro, avocado slices and fresh shredded cabbage (I use a bagged blend from the salad section, sue me). In a small bowl combine smoked paprika, onion powder, garlic powder, dried oregano, brown sugar, cayenne pepper, freshly cracked pepper, kosher salt and mix to combine spices. Rub cod filets with blackened spice blend on each side. In a medium skillet heat canola oil on medium-high heat. Test with a drop of water, water should ‘dance’ and fizzle to know pan is hot enough, usually takes 1-2 minutes. Drop cod filets into oil and cook for 2-3 minutes on each side. *Tip, use a fish spatula for easier flipping and less pan stick. Remove fish from pan when it begins to ‘flake’ easily and place on a paper towel lined plate. Heat tortillas via microwave in wet paper towels or gas stove burner (10 secs on each side should do it). In a small bowl combine sour cream, Sriracha and lime zest. Fill one tortilla side with shredded cabbage. Cut cod filets into large ‘chunks’ and drizzle with fresh lime juice. Fill tortilla with a generous portion of cod and top with all of desired toppings. Save Sriracha crema for last. *Tip! I transfer the crema into a zip lock back and drizzle on for the ultimate ‘restaurant’ feel at home. Best served with lots of cold beer and strong margaritas. I am so gonna try this today! Never had a fish taco before so wish me luck. Just made it for my son and me, easy and very tasty, to have again.